As an analyst in Goldman Sachs’ Special Situations Group from 2008-2011, Bastiaan Janmaat had a problem — he faced the daunting task of both compiling and updating spreadsheets containing information on hundreds of private companies. Always a tough task, such an undertaking has become exponentially more difficult with the emergence of the Internet and an attendant explosion in the variety of information sources available to analysts. While attending Stanford’s Graduate School of Business several years later, Janmaat came into contact with three other Stanford alumni who agreed that his problem was common but potentially solvable. Datafox, incorporated in 2013, represents their best attempt to confront the issue. Headquartered in the burgeoning South of Market (SoMa) neighborhood of San Francisco, Datafox occupies a former industrial loft shared with another early-stage startup. Though the firm’s workspace only comprises several computer workstations and a conference room, the Spartan furnishings of Datafox’s offices belie the complexity of their product, which is, in a nutshell, a Software as a Service (SaaS) financial analytics tool that tracks and reports on a myriad of private technology firms. Datafox covers private companies at all stages, from multibillion-dollar transportation provider Uber to digital payments company Venmo, providing metrics like employee counts, revenue estimates and user bases. “It’s predictive intelligence for analysts,” Janmaat explained, describing how the service aims to appeal to a core audience of professionals in banking, investing, business development and corporate development. According to Janmaat, the startup enters a commercial sphere ripe for disruption, as Datafox’s only direct competitor is Dun and Bradstreet, a corporate behemoth and S&P 500 constituent that employs manual data input as opposed to the automated processes that power the Datafox service. To effectively compete with Dun and Bradstreet and provide a worthwhile alternative to all of those analysts’ spreadsheets, Datafox seeks to harvest the “growing digital footprints” of private technology firms and present those conclusions in a palatable form. The main Datafox interface is fairly clean and intuitive, though it does take some getting used to. 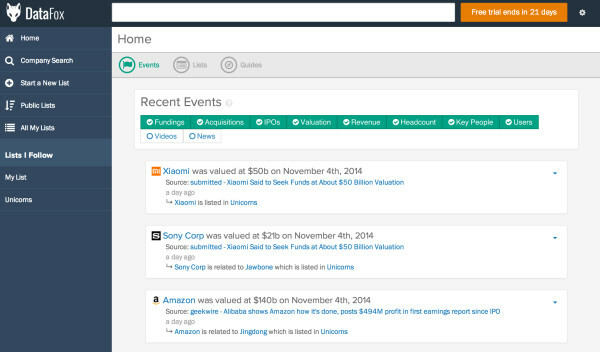 Upon navigating to datafox.co, the user is presented with a home view that provides a running live stream of events (acquisitions, revenue, IPOs, etc.) pertinent to the user’s chosen groups (or “lists”) of companies. There is a search bar at the top of the site that allows for more in-depth study of individual companies. 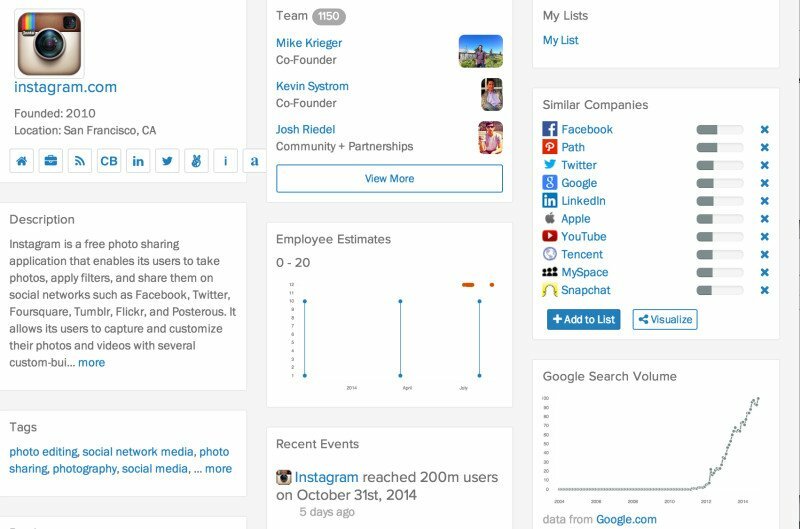 Additionally, there are publicly shared lists of companies that have been curated by the Datafox staff (for instance, Stanford GSB Startups, Enterprise Startups and the like). These lists can serve as proxy representations for entire sectors within the private tech sphere and are one of the service’s most compelling features. Of course, none of this functionality would be available without the machine-learning and data-collection algorithms that are at the heart of Datafox. The engineering-heavy composition of their team (seven software engineers for two business development employees), reflects the enterprise’s focus on product differentiation through technical superiority. The first three engineers were Janmaat’s co-founders, Mike Dorsey M.S. ‘11 M.B.A. ‘10, Alden Timme B.S. ‘11 M.S. ‘12, a natural language processing specialist, and Ben Trombley ‘07, a former software engineer at Box. The team explained that their overall goal is to make Datafox simultaneously close to customers and engineering-driven. Despite its impressive team and compelling product, Datafox is not without its deficiencies. For instance, one entry on this reporter’s Event Feed stated that Dropbox had attained 500 employees; upon reading the Forbes article from which this estimate was derived, the number turned out to be mostly speculation on the part of the author. Slight shortcomings like this one lend credence to the idea that when compared to the manually compiled databases it is intended to supplant, Datafox offers convenience, though perhaps at the expense of accuracy. However, as the startup refines its software, improvements in this area are all but guaranteed. For now, Datafox is in public beta, offering three different membership tiers — a limited $49 personal offering, the standard $400/month professional license and a bespoke enterprise solution. According to Janmaat, the firm’s revenue stream continues to grow despite the difficulties inherent in selling to larger banks and corporations. By employing a bottom-up sales strategy, Datafox is attempting to build a critical mass of analysts using their service on personal machines in the hope that the larger corporate structures that employ them will eventually formalize the relationship with Datafox. Looking toward the future, Janmaat is optimistic, especially about potential broader applications of the Datafox platform. In his eyes, private technology companies are just the beginning, as he foresees Datafox being adapted to cover a wider range of industries. Perhaps most excitingly, Datafox is continuously adding features that complete tasks traditionally executed by analysts, freeing them up for far less tedious work. You can talk to Cameron at camvdg ‘at’ stanford.edu.